This article is about the fast-food restaurant chain. For other uses, see Sonic (disambiguation). Sonic Corp., more commonly known as Sonic (stylized as SONIC), is the operator of an American drive-in fast-food restaurant chain based in Oklahoma City, Oklahoma, that is owned by Inspire Brands, the parent company of Arby's and Buffalo Wild Wings. As of September 5, 2018, there are 3,606 Sonic restaurants in 45 U.S. states. In 2011, it was ranked 10th in QSR Magazine's rankings of the top 50 quick-service and fast-casual restaurant brands in the nation (moving to 13th for 2015 and 2016). Known for its use of carhops on roller skates, the company annually hosts a competition to determine the top skating carhop in its system. Christina Vaughan, Senior Vice President Sonic Restaurants, Inc. 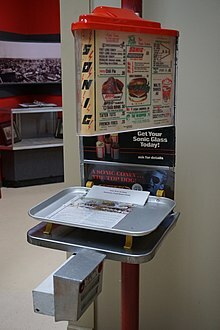 Although Sonic has operated since the early 1950s, Sonic Corp. incorporated in Delaware in 1978. 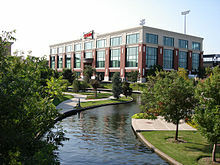 It has its corporate headquarters in Oklahoma City; the headquarters building features a dine-in Sonic restaurant in an adjacent building. Prior to its acquisition by Inspire Brands, its stock traded on NASDAQ with the symbol SONC. Company restaurants are owned and operated by Sonic Restaurants, Inc., a wholly owned subsidiary. Total 2016 revenues were around $100 million with net income of $18 million. Sonic's menu consists of hamburgers and French fries, as well as onion rings, corn dogs, chili dogs and breakfast toaster sandwiches. Drink options include soft drinks, slushes, and milkshakes. Customers can combine various drinks and flavors to create thousands of possible drink combinations. Ice cream desserts include sundaes and floats. At a standard Sonic Drive-In, a customer drives into a covered drive-in stall, orders through an intercom speaker system, and has the food delivered by a carhop. Most drive-ins also have patio seating, and many have drive-thru lanes. Following World War II, Sonic founder Troy N. Smith Sr. returned to his hometown of Seminole, Oklahoma, where he became employed as a milkman. He decided to work delivering bread because bread was not as heavy as milk. Soon afterwards, Smith purchased the Cottage Cafe, a little diner in Shawnee, Oklahoma. Before long, he sold it and opened a fast food restaurant, Troy's Pan Full of Chicken, on the edge of town. In 1953, Smith went in with a business partner to purchase a five-acre parcel of land that had a log house and a walk-up root beer stand, already named the Top Hat. The two men continued with the operation of the root beer stand and converted the log house into a steak restaurant. After realizing that the stand was averaging $700 a week in the sale of root beer, hamburgers, and hot dogs, Smith decided to focus on the more-profitable root beer stand. He also bought out his business partner. Originally, Top Hat customers would park their automobiles anywhere on the gravel parking lot and walk up to place their orders. However, on a trip to Louisiana, Smith saw a drive-in that used speakers for ordering. He suspected that he could increase his sales by controlling the parking and having the customers order from speakers at their cars, with carhops delivering the food to the cars. Smith borrowed several automobiles from a friend who owned a used-car lot to establish a layout for controlled parking. He also had some so-called "jukebox boys" come in and wire an intercom system in the parking lot. Sales immediately tripled. Charles Woodrow Pappe, an entrepreneur, chanced upon the Shawnee drive-in and was impressed. He and Smith negotiated the first franchise location in Woodward, Oklahoma, in 1956, based on nothing more than a handshake. By 1958, two more drive-ins were built, in Enid and Stillwater. Upon learning that the Top Hat name was already trademarked, Smith and Pappe changed the name to Sonic in 1959. The new name worked with their existing slogan, "Service with the Speed of Sound". After the name change, the first Sonic sign was installed at the Stillwater Top-Hat Drive-In; this was the first of three Sonics that would eventually exist in Stillwater. The original Sonic to carry the first sign was demolished and renovated in May 2015. Although Smith and Pappe were being asked to help open new franchise locations, no real royalty plan was in place. The pair decided to have their paper company charge an extra penny for each Sonic-label hamburger bag it sold. The proceeds would then be split between Smith and Pappe. The first franchise contracts under this plan were drawn up, but still no joint marketing plan, standardized menu, or detailed operating requirements were in place. Sonic's founders formed Sonic Supply as a supply and distribution division in the 1960s. Under Smith, longtime franchise holders Marvin Jirous and Matt Kinslow were hired to run the division. In 1973, Sonic Supply was restructured as a franchise company that was briefly named Sonic Systems of America, which provided franchisees with equipment, building plans, and basic operational instructions. As the company grew into a regionally known operation during the 1960s and 1970s, the drive-ins were mainly in small towns in Oklahoma, Texas, Kansas, New Mexico, Missouri, and Arkansas. In 1967, the year Pappe died, there were 41 drive-ins. By 1972, this number had risen to 165, and by 1978, 1,000. In 1968, Sonic introduced the Pickle-O's, fried pickle slices. In 1977, the company established the Sonic School for manager training. Franchisees operated most of the drive-ins and often made the store manager a business partner, even to this day. In 1983, the company's board of directors hired C. Stephen Lynn as president, and, in 1984, Lynn hired J. Clifford Hudson, an attorney, to head the legal department. Under Lynn, Sonic and its major franchisees began to encourage the development of local-advertising cooperatives which was developed with the leadership of Keith Sutterfield as Advertising Manager and later as V.P. of Marketing in which Sutterfield developed a field structure to work with the franchisees. New franchises began to expand the company into new areas and redevelop markets that had been unsuccessful in the past. These developments, combined with a major advertising campaign featuring singer and actor Frankie Avalon, led to significant growth and a new image that would make Sonic a nationally recognized name. In 1986, Lynn, with a group of investors, completed a $10-million leveraged buyout and took the company private. The next year, Sonic moved its offices to leased space at 120 Robert S. Kerr Avenue in downtown Oklahoma City and began to assume a higher profile in the community. In 1991, Sonic became a publicly traded company again. By 1994, the corporation had renegotiated the franchise agreements with its franchisees. In 1995, Hudson became president and chief executive officer, and Sonic Industries became Sonic Corp.
During the mid-1990s, Sonic opened 100–150 new restaurants a year. Beginning in 1998, Sonic began a retrofit program, called "Sonic 2000", to redesign and update all 1,750 stores in its chain to what was called a "retro-future" look. Hudson was named chairman of Sonic Corp. in January 2000. Celebrating its 50th birthday in 2003, Sonic briefly added the Birthday Cake Shake to the menu. As a part of the anniversary celebration, Pickle-O's made another appearance as a recurring item. Development milestones celebrated in the 2000s include the opening of the 3,000th Sonic Drive-In in Shawnee, Oklahoma, and the 3,500th Sonic Drive-In in the Chicago market (Algonquin, Illinois). In October 2004, President Pattye Moore stepped down to spend more time with her family. On June 28, 2005, helped by new menu items and increased advertising exposure, Sonic Corp. reported double-digit increases in net income and revenue in the third quarter that year. On January 5, 2005, the company started to roll out card readers in the drive-in stalls at its 544 company-owned restaurants by the end of January that year. In 2007, the company opened its first restaurants in the Northeastern United States, in Waretown, New Jersey, near the Jersey Shore. In 2009, Sonic partnered with DonorsChoose.org on a collaborative effort, Limeades for Learning, the chain's first systemwide cause marketing initiative. Public school teachers request needed supplies and materials and Sonic customers vote on how to allocate over $500,000 each autumn. In the first seven years of the program, Sonic and its franchisees donated more than $6 million and impacted learning for more than 349,000 students nationwide. In September 2009, Omar Janjua joined the company as president of its restaurant operating subsidiary, Sonic Restaurants, Inc. ("SRI") and left in 2015. Despite growth into new markets outside the brand's traditional footprint, the company was hit hard by the recession of 2008–2009. In 2009, the brand had multiple quarters of declines in same-store sales for the first time in recent memory. [clarification needed] Plans to bring Sonic to Alaska have not come to fruition. On October 26, 2015, Sonic opened its first Rhode Island location in Smithfield, reporting to have received 500 orders on its opening day. In the mid-2010s, the company began a refranchising effort and began to add to its numbers of stores again. In January 2010, Sonic announced that they would begin switching to cage-free eggs, gestation crate-free pork, and chickens killed using controlled-atmosphere stunning methods instead of traditional shackling and water-stunning. Sonic reformulated its popular soft-serve ice cream to meet the FDA guidelines that define what constitutes real ice cream and introduced Real Ice Cream on May 17, 2010. Several new hot dog items were also introduced in June 2010 and February 2011. Craig Miller was hired as chief information officer for Sonic in January 2012. In June 2010, Danielle Vona was hired as chief marketing officer. In late 2010, Sonic announced it was ending its 17-year relationship with advertising agency Barkley. A group of specialized agencies were selected to represent the company, and in early 2011, the San Francisco-based Goodby Silverstein & Partners was named as the new creative agency for the company. In 2017, Sonic added seven new stores in Hawaii. On September 25, 2018, Atlanta-based Inspire Brands, owner of Arby's and Buffalo Wild Wings, announced that it was buying Sonic Drive-In for $2.3 billion. The acquisition was completed on December 7, 2018. In February 2019, it was reported that employees of three Ohio locations resigned en masse due to management changes and a 50% reduction of the employee hourly pay rate. In June 2011, the first location under the name Sonic Beach was opened in Homestead, Florida. A second location, opened in Fort Lauderdale, Florida, in November 2011, lacks the usual drive-in stalls due to its beach-side location. Both locations also include outdoor seating and flatscreen televisions. A third location was opened in Miami Gardens across from Hard Rock Stadium. The fourth location was opened January 2014 in Lauderhill. Along with the traditional menu items, Sonic Beach offers several new items including popcorn shrimp, Philly cheesesteaks, and pulled pork sandwiches. Sonic Beach also serves beer and wine. Sonic ran its first television advertisement in 1977. During the early 1980s, actor Tom Bosley was featured in the company's commercials. One of the company's most memorable advertising campaigns, which ran from 1987 to 1993, featured Frankie Avalon. In May 1999, the company began a new campaign featuring the character Katie the Carhop. Sonic was also involved with NASCAR. The company contracted with Richard Childress Racing in late 2000 to be an associate sponsor for Dale Earnhardt, Sr. during the 2001 NASCAR Winston Cup Series season. After Earnhardt was killed on the last lap of the Daytona 500, the company continued its sponsorship with his replacement driver Kevin Harvick, through the end of the 2003 season. In 2004, the company became more widely known nationally by advertising in television markets hundreds of miles from its nearest franchise. Improvisational actors T. J. Jagodowski and Peter Grosz became known to American television viewers from their "Two Guys" series of commercials. Similar series of ads for the company have featured other duos of improvisational performers, including Molly Erdman and Brian Huskey, Katie Rich and Sayjal Joshi, and Emily Wilson and Tim Baltz. In 2010, national auditions were held and a new series of commercials began airing, some of which featured carhops from Wisconsin and Austin, Texas. In 2012 the "Two Guys" returned to the company's television ads. In 2018 Sonic supplemented their "Two Guys" commercials with complementary "Two Gals" commercials. The "Two Gals" are played by Ellie Kemper and Jane Krakowski. ^ a b c d e "2016 Annual Report to Stockholders" (PDF). Sonic corp. Retrieved November 10, 2016. ^ Monica, Paul R. La. "Sonic sold to Arby's and Buffalo Wild Wings owner for $2.3 billion". CNNMoney. Retrieved September 26, 2018. ^ tory (August 2, 2016). "The QSR 50". qsrmagazine.com. Retrieved March 28, 2018. ^ "SONC Filings Information". Retrieved May 29, 2012. ^ JAVIER C. HERNANDEZ (November 2, 2009). "Troy Smith, Founder of Sonic, Dies at 87". The New York Times. Retrieved May 29, 2012. ^ "Sonic Menu". FastFoodSource.com. Retrieved May 29, 2012. ^ Bialik, Carl (November 27, 2007). "Counting the Drink Combos at a Sonic Drive-In". The Wall Street Journal. Retrieved July 5, 2008. ^ a b c d e f g Blackburn, Bob L. (2009). Sonic: The History of America's Drive-in. Oklahoma City, Okla: Cottonwood Publications. ISBN 978-9720244024. ^ a b Velasco, Schuyler (August 21, 2013). "10 fast foods that have disappeared: 8. Pickle-O's". Christian Science Monitor. Retrieved March 11, 2014. ^ "Sonic | The Encyclopedia of Oklahoma History and Culture". Okhistory.org. Retrieved November 7, 2017. ^ "Company History: Sonic Corp". Hoover's Company Profiles. Answers.com. Retrieved May 22, 2012. ^ a b "A Brand New Look in 1998". Sonic Corp. — Company Profile, Information, Business Description, History, Background Information on Sonic Corp. NetIndustries, LLC. 2007. Retrieved July 21, 2008. ^ "Sonic Corp". Funding Universe. Retrieved February 29, 2012. ^ "Public Again in 1991". Sonic Corp. — Company Profile, Information, Business Description, History, Background Information on Sonic Corp. NetIndustries, LLC. 2007. Retrieved July 21, 2008. ^ a b Executive Team Member Profile: J. Clifford Hudson. Official Sonic Web Site, America's Drive-in Brand Properties LLC. ^ "Sonic celebrates 50 years with new birthday cake shake: Around Town". The Journal Record. May 5, 2003. Retrieved August 9, 2012. ^ "Sonic Drive-In shakes things up for its 50 th Birthday in May" (PDF). Retrieved March 16, 2012. ^ "Sonic grand opening is a wiener". Chatham Journal. August 23, 2005. Retrieved August 9, 2012. ^ "Sonic Touts 3,500 Driven-Ins Milestone — Restaurant News". QSR magazine. Retrieved March 16, 2012. ^ "Sonic president leaving for more family time". ^ "Sonic Corp. sees rise in revenu". ^ "Sonic makes it easier for card-carrying customers". ^ "Sonic, The Fast Food Drive-In Chain, Is Taking Over New Jersey". njmonthly.com. Retrieved March 16, 2012. ^ "Limeades for Learning" Check |url= value (help). Retrieved May 29, 2012. ^ "Sonic moves into super-sonic phase with Limeade for Learning campaign". QSRWeb. September 27, 2016. Retrieved November 7, 2017. ^ "Sonic Appoints New President Of Sonic Restaurants, Inc. And Announces Other Management Change". Retrieved March 16, 2012. ^ Ron Ruggless (September 7, 2009). "Sonic names Omar Janjua chain president". Restaurant News. Retrieved August 9, 2012. ^ Comment * (September 8, 2009). "Sonic names Omar Janjua chain president | Nation's Restaurant News". Nrn.com. Retrieved November 7, 2017. ^ September 18, 2009 (September 18, 2009). "Sonic Declares Preliminary Results - September 18, 2009". Zacks.com. Retrieved November 7, 2017. ^ Staff writer (September 18, 2009). "Sonic Declares Preliminary Earnings". Zacks Equity Research via Yahoo! Finance. Accessed 2009-10-16. ^ Tomison, Bill (October 26, 2015). "SONIC Drive-In opens in Smithfield | WPRI 12 Eyewitness News". Wpri.com. Retrieved November 7, 2017. ^ "Sonic franchise deal puts refranchising program ahead of schedule". QSRWeb. February 9, 2017. Retrieved November 7, 2017. ^ "Sonic Keeps It Real This Summer with the Introduction of Real Ice Cream". Retrieved March 16, 2012. ^ Jennifer Lawinski (May 17, 2010). "Sonic Promotes 'Real Ice Cream' Launch With Free Shakes". Huffington Post Food. Retrieved August 9, 2012. ^ "Sonic upgrades soft serve to 'Real Ice Cream'". QSRWeb. May 16, 2010. Retrieved November 7, 2017. ^ Comment * (June 28, 2010). "Sonic introduces new footlong hot dog | Nation's Restaurant News". Nrn.com. Retrieved November 7, 2017. ^ "Sonic Introduces New Footlong Quarter Pound Coney". Retrieved March 16, 2012. ^ "Sonic Reinvents Ballpark Classic, Debuts Four New Premium Beef Hot Dogs". Retrieved March 16, 2012. ^ Christa Hoyland (June 27, 2010). "Sonic rolls out bigger, better Footlong Quarter Pound Coney". QSRweb. Retrieved August 9, 2012. ^ "Sonic rolls out bigger, better Footlong Quarter Pound Coney". QSRWeb. June 27, 2010. Retrieved November 7, 2017. ^ Christi Ravneberg (April 20, 2012). "MenuMasters 2012: Sonic, America's Drive-In". Restaurant News. Retrieved August 9, 2012. ^ Baskin, Anna (February 8, 2012). "People on the Move: James O'Reilly Is Sonic's New CMO | People & Players". AdAge. Retrieved November 7, 2017. ^ "Sonic Appoints New Chief Information Officer". Retrieved March 16, 2012. ^ "Executive Bios". Retrieved August 9, 2012. ^ Ron Ruggless (February 3, 2012). "Sonic names James O'Reilly CMO". Restaurant News. Retrieved August 9, 2012. ^ Comment * (February 3, 2012). "Sonic names James O'Reilly CMO | Nation's Restaurant News". Nrn.com. Retrieved November 7, 2017. ^ "Sonic Appoints New Chief Marketing Officer". Retrieved March 16, 2012. ^ "Sonic Appoints Danielle Vona Chief Marketing Officer - Quick Facts". Rttnews.com. June 21, 2010. Retrieved November 7, 2017. ^ Morrison, Maureen (February 2, 2011). "Sonic Names Goodby Creative Agency of Record | Agency News". AdAge. Retrieved November 7, 2017. ^ "Goodby Silverstein & Partners Named as New Creative Agency of Record Sonic Rounds out Marketing Partners Portfolio". Retrieved March 16, 2012. ^ Maureen Morrison (February 2, 2011). "Sonic Names Goodby Creative Agency of Record". Ad Age. Retrieved August 9, 2012. ^ "Sonic opening 7 locations in Hawaii - Honolulu, Hawaii news, sports & weather - KITV Channel 4". Kitv.com. Retrieved November 7, 2017. ^ Thorn, Bret (September 25, 2018). "Inspire Brands to buy Sonic Corp. for $2.3B". Nation's Restaurant News. Retrieved September 25, 2018. ^ Ruggless, Ron (December 7, 2018). "Inspire closes on Sonic acquisition". Nation's Restaurant News. Retrieved December 8, 2018. ^ Weissman, Cale. "Ohio Sonic drive-in staff quit after wages were reportedly reduced from Ohio's state minimum wage of $8.55/hour to $4/hour (plus tips)". Fast Company. Retrieved March 1, 2019. ^ Forgie, Adam. "Entire staffs at 3 Sonic locations quit after wages cut to '$4/hour plus tips'". CBS4Local. Retrieved March 2, 2019. ^ "Ft. Lauderdale Beach Location". Sonic Beach. 2011. Retrieved May 31, 2012. ^ "Sonic Beach Florida Restaurants". Sonic Beach. 2014. Retrieved February 10, 2014. ^ "About Sonic Beach". Sonic Beach. 2011. Retrieved May 31, 2012. ^ "Chronology". Sonic Corp. — Company Profile, Information, Business Description, History, Background Information on Sonic Corp. NetIndustries, LLC. 2007. Retrieved July 5, 2008. ^ Perlik, Allison (July 1, 2004). "The 400 at 40 — A Retrospective". Restaurants & Institutions. Retrieved July 5, 2008. ^ "A Brand New Look in 1998". Sonic Corp. — Company Profile, Information, Business Description, History, Background Information on Sonic Corp. NetIndustries, LLC. 2007. Retrieved July 5, 2008. ^ Arellano, Kristi (July 2, 1999). "The Sonic Boom — Chain of Drive-Ins Making Big Comeback". Denver Business Journal. Retrieved July 5, 2008. ^ Richard Alm (April 13, 2002). "Sponsors driving NASCAR success / Racing stars work hard with companies that pay the freight". The Dallas Morning News. Retrieved May 29, 2012. ^ Bob Garfield (July 16, 2007). "Sonic Has Great Actors in Great Ads". Ad Age. Retrieved May 29, 2012. ^ Bob Marshall (February 22, 2012). "Sonic's 'Two Guys' Get 'Rehired' in Social Media Publicity Stunt | AgencySpy". Adweek.com. Retrieved November 7, 2017. ^ Peter Romeo (March 6, 2018). "SONIC ADDS 2 GALS TO 'TWO GUYS'". RestaurantBusinessOnline.com. Retrieved July 10, 2018. ^ "LaFayette Sonic taking part in summer jubilee". Walker County Messenger. June 15, 1993. Retrieved May 29, 2012. ^ Gene Owens (December 6, 2007). "Adverb or adjective? Sometimes a close call". The Oklahoman. Retrieved May 29, 2012. ^ Jeff Martin (June 12, 2009). "Lights, action, limeade". Examiner. ^ Abe Sauer (May 24, 2011). "Sonic Launches 'This Is How You Facebook Connect' Crowdsourcer". Brandchannel. Retrieved May 29, 2012. 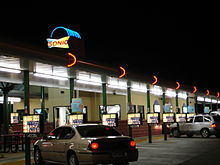 Wikimedia Commons has media related to Sonic Drive-In.